Gathered around the Passover table, Jesus reclined with his disciples for one final meal, one last teaching moment, one last time to show them the depths to which God was willing to go in order to save his people. It was the Passover, the commemoration of the day when God delivered his children Israel with an out stretched arm and mighty act of judgment. Ex 6:6 There is no way the twelve could know the events that lay ahead. Jesus would be arrested. He would be falsely charged and condemned. Mere hours later, Jesus would suffer death by crucifixion. Jesus; however, knew all of this. He knew exactly what the coming hours would bring; pain, agony, death. Jesus also knew the fear and anxiety his disciples would feel. They would feel intense sorrow at the loss of their master. Fear would strongly grasp each one and grief would pierce their hearts. And so, as he did so many times before, Jesus gave of himself once more in the breaking of the bread and pouring of the cup. Burdened by the weight of our sin, we also take our place at the table. We stretch out our empty sinful hands filled with the shortcomings of human life, offering only this to our God who is slow to anger and abounding in steadfast love. In his compassion and mercy, God lifts the burden of sin from our hands, replacing it with life, love and grace. Eating this bread, which is the body of Christ and drinking this wine, which is the new covenant in his blood, we realize the tender mercies of our Lord. Jesus comes to us spiritually and physically in order that we may feel the power of God’s love. This is not a memorial meal as was the Passover. It is not simply a means by which to remember how Jesus offered himself up for the sake of God’s people. It is real just as God’s grace is real. It is physical just as Christ’s body and blood is physical. Jesus continues to offer his body and blood because he knows we need it. 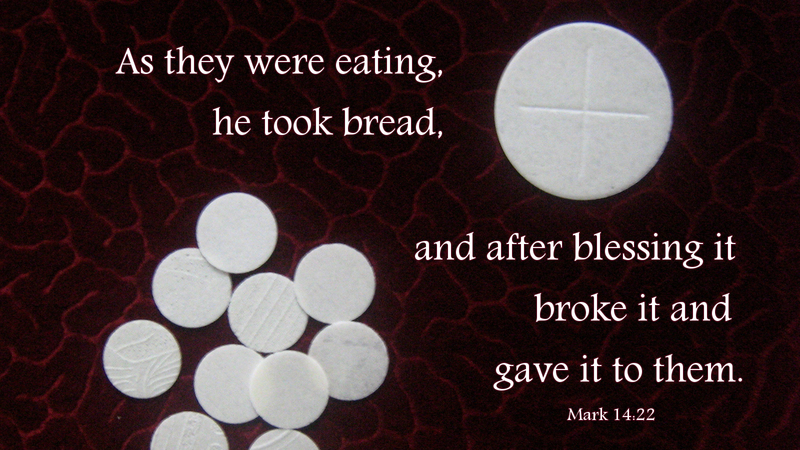 He feeds us the bread of life because without it we have no life in us. This is the power of God’s love made manifest through Christ Jesus, that he would send his only begotten Son to die for the sake of his people. Thank Lord, for this bread and for this cup, through which you fill us with your grace. Amen. This entry was posted in Gospel According to Mark and tagged Body of Christ, Christianity, Eucharist, faith, Grace, Holy Communion, Jesus Christ, Last Supper, Lord's Supper, religion, Spirituality. Bookmark the permalink.